David Roberts R.A. (1796-1864), Scottish painter explorer, visited Egypt and the Holy Land in 1839 painting the historical sites and the then "lost city" of Petra. From these, a book of lithographs was published copies of which are still found all over Egypt and Jordan. He was an ancestor of mine and I have been familiar with his work all my life. 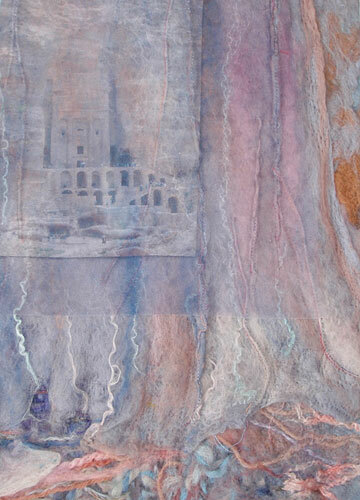 In 2007 I visited Petra and have been working on pieces to express my reactions to the experience – the scale of the monuments, the rugged landscape, rock colours, history – ancient and modern, and in the final piece I try to pay tribute to Roberts by incorporating images of him in arab dress and his work alongside my own. 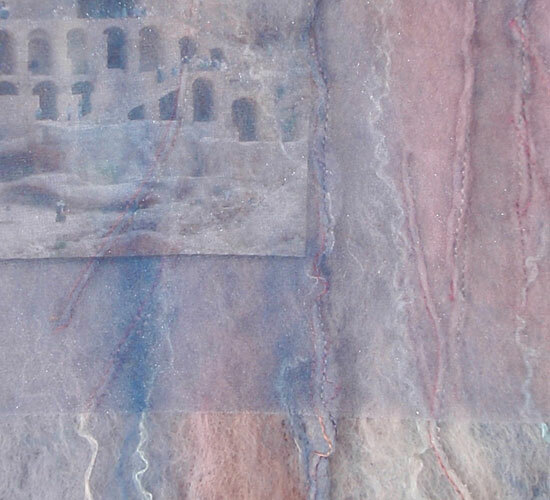 My pieces are mainly felt with hand and machine embroidery which I feel is sympathetic to the many textures of the rock and incorporate images of the Area.